Filtered Water, Citric Acid, Natural and Artificial Flavors, Sodium Benzoate as a Preservative and May Contain Gum Arabic, Proplyene Glycol, Caramel Color, FD&C Red #40, Yellow #5, Yellow #6, Blue #1, Salt and Potassium Sorbate. 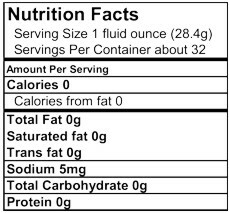 There are no Nutrition Facts for the concentrate. The concentrate is a component of the finished syrup. How you make the syrup determines the nutritional content. The nutritional content of the finished syrup will vary depending on if it’s made with sugar or artificial sweetener and the amount of concentrate used. Contains: A Mixture of High Fructose Corn Syrup and Granulated Sugar, Filtered Water, Citric Acid, Natural & Artificial Flavors, Sodium Benzoate As A Preservative and May Contain: Caramel Color, FD&C Red#40, Yellow#5, Yellow#6, Blue#1, Salt, And Potassium Sorbate. Contains: Filtered Water, Citric Acid, Natural and Artificial Flavors, Sucralose, Ace K, Sodium Benzoate And Potassium Sorbate (Preservatives) and May Contain: Caramel Color, FD&C Red#40, Yellow#5, Yellow #6, Blue#1. Click the links below for more information on artificial sweeteners.